This is a painting that I’m still working on, but it’s nearing the finish line. 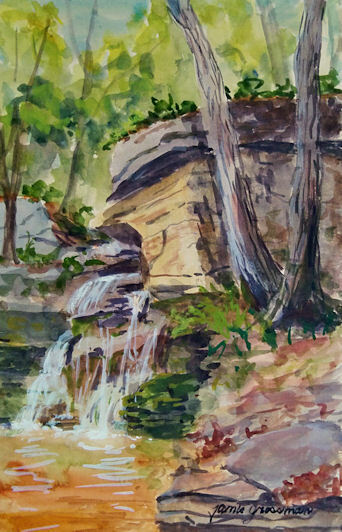 I spent two days working on it out on location, hiking 3/4 of a mile back into the woods with my painting gear. The light changed quickly. I think what I’ll have to do at this location in the future is to work on several paintings over a period of several days, so each time the light changes, I can switch to another painting done during that time frame. I’ll either finish this one up in the studio, or make another return trip to the falls. It was great fun to paint this, using transparent layers, pulling out lights and adding darks, then building to opaque sections. I love painting this size and larger. It’s mainly transporting all that gear, plus the limited time factors, that keep me painting smaller on site most of the time. I’ve resolved most of the setup issue by using light tripod easels and clamping a light palette to the easel itself, rather than carting my Soltek easel (which weighs a ton but handles large panels with ease) or one of the popular box/tripod solutions. Although the box/tripod setups are touted as being “light”, they aren’t light for me! I guess “light” is a relative term. I’ll be reposting this once it’s finished. With all the rain expected over the next week, it might be sooner rather than later if I have studio time to fill! Yep, another waterfall! 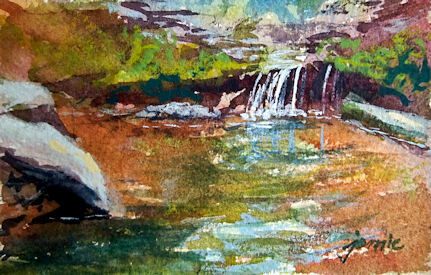 Spring is the best time of year to paint waterfalls. It’s not long before they either dry up during the summer, or are far less dramatic as the flow diminishes. This one was also painted out on location. It’s watercolor on 1/8 sheet of Stonehenge Fawn paper. It’s a 100% cotton rag printmaking paper — very high quality, not too much tooth, and I love painting watercolor and gouache on it. This is one of my favorite sizes to paint. It works so well for both vertical and horizontal compositions, and allows me to tear down a page with no waste. What I end up with is not a standard frame size, so to make it easier for buyers, the price includes a custom, ivory-colored archival mat, acid free backing board, and will arrive sealed in a polybag for protection and gift-giving. You’ll be able to just buy an inexpensive, standard frame into which you can pop the already-prepared painting, or take it to your local framer and you won’t have to purchase a mat and backing board. Custom matted to 7×5″ to fit any standard 5×7″ frame, with acid free foamcore backing board and acid free ivory mat, in a polybag. Mat is ivory color. 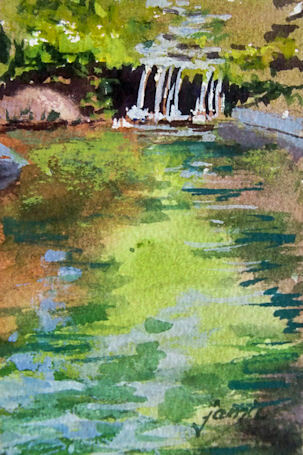 Watercolor and gouache on Arches Rough 140# rag paper. This little stream runs through our property, cascading over rocks and waterfalls. This is the fourth in my series of compositional studies — a vertical orientation with a high horizon line. I’ve had custom, archival mats and backing boards made for all the sizes I generally paint when working on paper. The good news for my collectors is that from now on, my non-standard size paintings and sketches on paper will come to you already matted and ready to frame in standard sizes. They are beautiful ivory-colored archival mats, acid free backing boards, and will arrive sealed in polybags for protection and gift-giving. You’ll be able to just buy an inexpensive, standard frame into which you can pop the already-prepared painting, or take it to your local framer and you won’t have to purchase a mat and backing board. This painting can be purchased at auction tomorrow at 4:30 at Garrison Art Center. The painting looks far better than this photo, which was taken with my cellphone camera. The blues are not so intense and of course the painting is in focus! I hiked up to the peak of Little Stoney Point in Cold Spring-on-Hudson this morning to do this 12×16″ oil painting for the Garrison Art Center’s famous event, Artists on Location. The painting will be auctioned tomorrow afternoon at the Art Center along with works by 75 other artists. I’m sorry about the awful photo, taken with my cellphone camera in dim room lighting after I framed and delivered the painting. I didn’t bring a better camera because I didn’t want to lug one to the top of the cliffs! 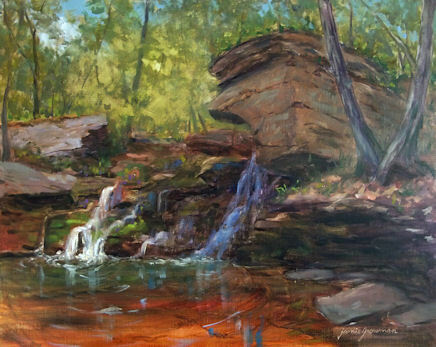 But all the paintings for the event will be there for you to see in person. 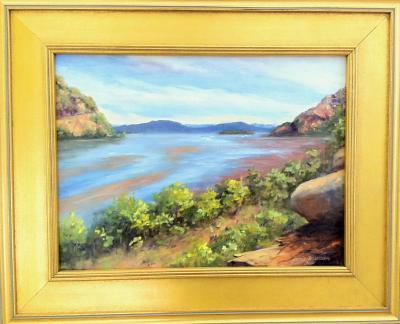 The painting depicts the northern entrance to the Hudson Higlands section of the Hudson River, between Breakneck Ridge on the right, and Storm King Mountain on the left. The island on the right side is Bannerman Island, famous for the castle ruins located there and its history. The Highlands is to me the most dramatic section of the River. I was standing at the end of Little Stony Point, and the Hudson sweeps around and past as it makes its way down toward West Point. 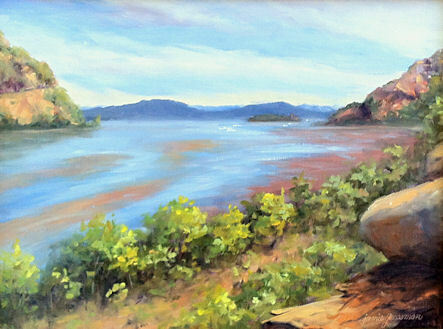 I could spend a month painting at this location and not get tired of it! As I was finishing up the painting, a big wind gust came along and took down my entire easel. The easel broke and my paint, brushes and turp went everywhere! Fortunately, having feared the worst as the gusts got stronger, I had already removed the painting from the easel. After that, I forgot to even photograph the painting on site. It wasn’t until I had already delivered the painting that I realized I hadn’t taken a picture, so I dashed back in with my cellphone camera. What a day! But hey, any day painting is better than a day not painting! Here’s an image of the framed painting, though I’m sorry to say that it’s not any better an image, also taken with my cellphone. This little stream runs through our property, cascading over rocks and waterfalls. 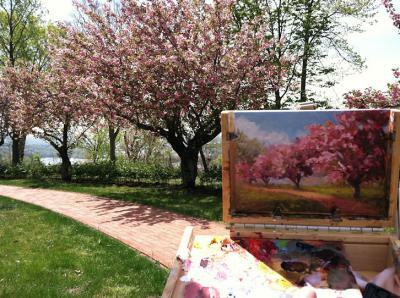 It gives me endless enjoyment to paint there on a beautiful day. I wanted to explore some compositional ideas, each of which brings out different elements in the landscape, so I did a series of small watercolors, setting the horizon at different points, with vertical and horizontal orientations. This was the third one — a vertical orientation with a high horizon line. This painting will arrive custom matted to 5×7″ to fit any standard 5×7″ frame, with acid free foamcore backing board and acid free ivory mat, in a polybag. Mat is ivory color. 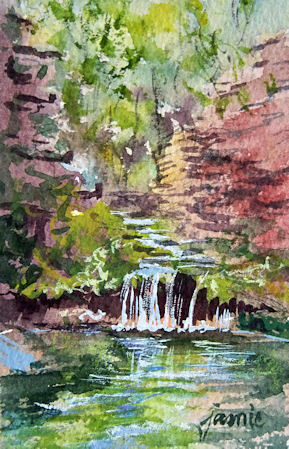 Image is 3×4.5″ on Arches Rough 140# rag paper. 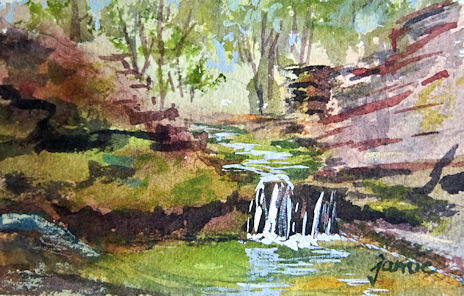 This little stream runs through our property, cascading over rocks and waterfalls. 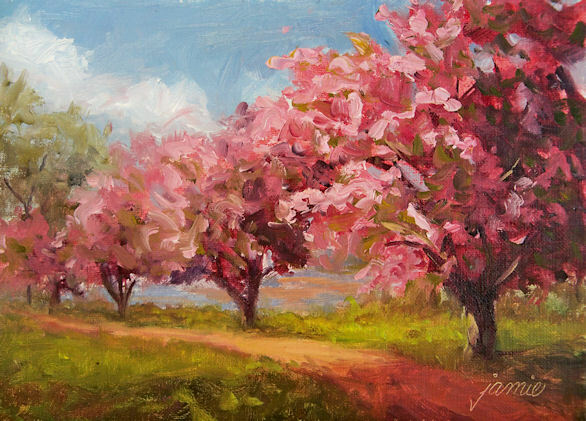 It gives me endless enjoyment to paint there on a beautiful day. I wanted to explore some compositional ideas, each of which brings out different elements in the landscape, so I did a series of small watercolors, setting the horizon at different points, with vertical and horizontal orientations. This was the second one — horizontal orientation with a high horizon line. This little stream runs through our property, cascading over rocks and waterfalls. It gives me endless enjoyment to paint there on a beautiful day. I wanted to explore some compositional ideas, each of which brings out different elements in the landscape, so I did a series of small watercolors, setting the horizon at different points, with vertical and horizontal orientations. This was the first one — horizontal orientation with a low horizon line. I’ve had custom, archival mats and backing boards made for all the sizes I generally paint when working on paper. The good news for my collectors is that they can now buy my non-standard size paintings and sketches on paper already matted and ready to frame in standard sizes. They are beautiful ivory-colored archival mats, acid free backing boards, and will arrive sealed in polybags for protection and gift-giving. You’ll be able to just buy an inexpensive, standard frame into which you can pop the already-prepared painting. 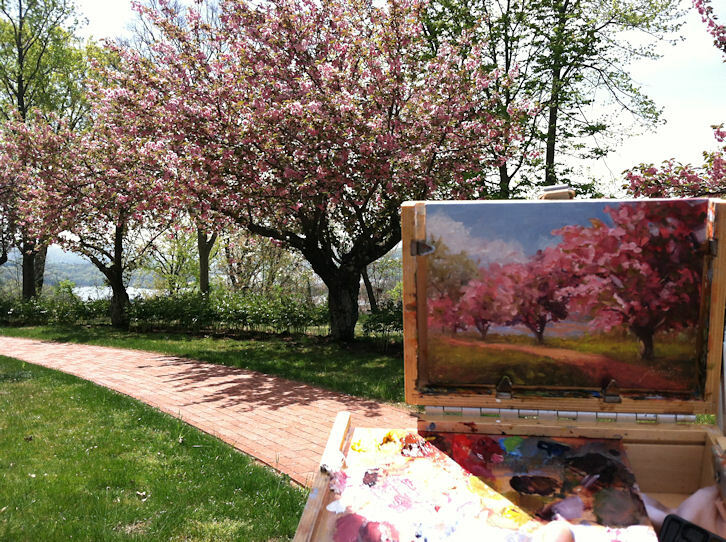 Usually I do a large painting on site when the cherry blossoms are blooming along the Hudson River overlook at Boscobel. This year I didn’t plan well enough and ended up short on time to catch the blooms before the rain was predicted to take them all down! I dashed over there and set myself down along the path with my little 5×7 Guerrilla box, so I could at least get in a small one before they vanished. I wish the season were longer. I can never get enough of these amazing trees while they’re in bloom. Above is a photo of the scene and my painting. (You can click that image to see it larger.) By the time the painting was done, the sun had shifted all the way around, so the light in the scene at the time of the photo is not the same as the light in the painting.